Based on the underlying assumption that gender is a social construct, this chapter explores the World Wide Web home pages of key political figures in the USA and Ukraine focusing specifically on what the content posted to these sites and their structure suggests about gender and cultural peculiarities in constructing political identity on the Web. The personal page is rendered as a virtual political office—a peculiar meeting point between the site owner and its potential audience, electorate, and citizenry providing an excellent working place to be constantly in touch with the electoral body from anyplace and in anytime. All data are analyzed according to four parameters: male, female, Ukrainian, and American. The main result highlights the intersection across culture, gender, and computer-mediated communication (CMC) influencing the virtual identity formation. The intersectional approach towards viewing gendered virtual identity is proposed. The data obtained lead to suggestions for the creation of sites that are more in line with the potential provided by the Net to facilitate political communication. Culture: This refers to the set of attitudes, values, beliefs, and behaviors that are shared by a group or people but that differ for every individual and that are communicated from one generation to another. Culture, like gender, affects virtually every aspects of life. A culture consists of structures and practices that uphold a particular social order by legitimizing certain values, expectations, meanings, and patterns of behavior. To explore this supposition, it is helpful to consider how culture creates and sustains more basic values, democracy, and then how culture upholds the gender practices ( Wood, 2003 , p.28). Intersectionality: This is a new approach in gender studies based on the supposition that gender lies on the crossroads of many social factors: power, class, race, nation, and so forth. It presents a conventional product stipulated greatly by these factors. Intersectionality is considered as a paradigmatic approach, especially applied to activism and social activities. It argues that the classical models of oppression within a society, such as those based on race/ethnicity, gender, religion, sexuality, class, disability, and other markers of difference do not act independently of one another. Instead, these forms of oppression interrelate, based on which markers apply to a given individual (and intersectionality derives its name from this intersection of forms of oppression). Intersectionality thus holds that knowing, for example, that a woman lives in a sexist society is insufficient information to describe her experience; instead, it is also necessary to know her race, her sexual orientation, her class, and so forth. 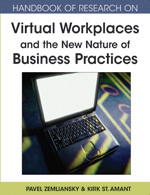 Virtual Workplace: This is a workplace that is not located in any one physical space. Rather, several workplaces are technologically connected (via the net) without regard to geographic boundaries. Employees are thus able to interact and work with one another in a collaborated environment regardless of where they are in the world. A virtual workplace decreases unnecessary costs by integrating technology processes, people processes, and online processes. In this chapter, personal pages of politics are rendered as peculiar virtual political offices for their owners providing great opportunities to communicate with their target audiences. Personal Web Page: This is defined in CMC theory as a Web site that is typically maintained by one individual or family or an organization ( Dominick, 1999 , p. 646). Personal home pages enable people to create their own content and distribute it on the net. Usually the start or the home page presents the first document that users encounter when entering the site. The home page orientates the user to the site, informs about its purpose, states what type of information can be obtained, and provides links to other relevant sites or documents. Cyber-Politics: This involves information dissemination, communication exchange, and the formation of electronic political coalitions across the Internet. This includes a variety of media including e-mail, Web pages, discussion groups, online databases and research, and online news. Identity: This is rendered differently during the various historical periods. In premodern societies, an individual identity was fixed, solid, and stable. Identity was based on predefined social roles and traditional societal systems with established beliefs and behavior patterns. Identity was not a subject of reflection or negotiation. Identity theories traditionally assume a notion of identity as homogeneous and stable; however, postmodern identity is understood as a patchwork or pastiche of independent and partially contradictory subidentities, which are to be constructed anew in everyday identity work and related to one another to support a sense of coherence. Computer-Mediated Communication (CMC): This is the term that describes popular applications of the network, including electronic mail, electronic bulletin boards, Web pages, and so forth. The CMC is the class of computer-based technologies to assist people in getting in touch with each other. In this chapter, I review how key political actors through their personal home pages use all possibilities provided by the net and how CMC has found its way into the political office routine activity. Political Communication: Participating in the political process is a privilege of any democratic society. It is vital to maintaining a healthy democratic community. Central to political communication is political communication. It involves the public, the mass media, the government, and the interest groups providing the link among them. It initiates the models of relations between political institutions and individuals. The Internet makes it easier for people to communicate with their government representatives, politically organize, debate topics, and educate each other about political issues. In its turn, main political actors are able to communicate effectively through the Web with their citizenry. Thus the net provides a new communication channel for sending political message and receiving citizen feedback ( Barnes, 2003 , pp. 291-311). Gender: This is rendered as social and cultural construct. Gender is viewed as a set of male and female behavioral and mental potentials that are shaped and developed by particular societies. Studying gender across cultures also allows us to appreciate and perhaps to refute arguments about the essential differences between women and men. At the same time, such comparative studies permit us to identify and celebrate any true universals about men and women.